Busy field. Runners take part in last night's popular Sunderland 5k at Silksworth Sports Complex, Pictures by Tom Banks. 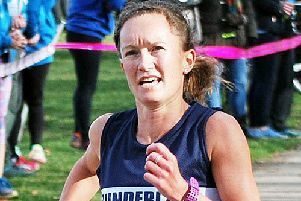 Sunderland Harriers’ women upset the applecart to triumph in the Northern team championship in their own Sunderland 5k Road Race at Silksworth Sports Complex last night. This was easily their best ever performance in the short history of the women’s team, who have been managed to glory by 70-year-old Eddie Maddison. They placed their three counters inside the first 10 runners home to score 26 points, with Tyne Bridge second on 33 and North Shields third with 34. Alice Smith led the team home in a solid sixth position (18min 32sec), then came 20-year-old Jess Fox in seventh (18.48) and the third and final counter was 17-year-old Sarah Knight (19.14). The race was won by runaway winner Danielle Hodgkinson in the superb time of 16.31. North Shields athlete Charlotte Penfold was second (17.10) and Jarrow and Hebburn’s Georgia Campbell filled third (17.39). Heaton Harrier Danielle Smyth finished fourth (17.48) and Robyn Bennett (Morpeth) was fifth (18.25). Last year’s runner-up, Dominic Shaw (New Marske), dominated the men’s race from start to finish and eventually ran out the winner by 15 seconds. He clocked 14.33 to head Morpeth’s Sam Hancox, who also had a superb run to clock a personal best (14.48). Houghton Harrier Alex Brown produced his best ever performance to crack 15 minutes for the first time, recording 14.49. There were five men under 15 minutes and the other two were Tyne Bridge Harrier Tom Charlton, in fourth (14.51), and Sunderland Harrier Oliver James, who slipped back on the last lap two places to finish fifth (14.58). Shaw said: “I love this course and it was a perfect night to run a fast time with there being no wind. Behind James came Tyne Bridge Harrier Carl Smith in sixth (15.04) followed by Middlesbrough’s Greg Jayasuriya (15.12). Gateshead Harrier Conrad Franks was eighth (15.13) and Morpeth completed the top 10 by having Thomas Straughan in ninth (15.13) and Joe Armstrong 10th (15.14). Sunderland Harriers won surprise team bronze medals behind Morpeth and Tyne Bridge. Backing James were Kevin Jeffress in 16th (15.29) and Ian Dixon in 28th (16.07). North Shields’ Over-55 Guy Bracken won the Over-50 race in a startling 16.12. Sunderland Harrier Paul Collins finished an impressive third in 17.17 and Over-55 Paul Merrison finished 10th in 17.59.